After reading several Holocaust memoirs, I wanted to know how “normal” Jews live, Jews whose ancestors had emigrated from Europe before Hitler had a chance to murder them in gas chambers, Jews who had not lost any immediate family in the Holocaust.Mirta Trupp’s memoir was the right book for me to read. It taught me a lot. First of all, it made me realize that while there are “normal” Jews, there is, obviously and sadly, no normal life for Jews. It starts with Mirta’s ancestors migrating from Prussia to Lithuania to the Ukraine, without finding a place where they could permanently live in peace. It continues with Mirta’s great-grandparents, some time around 1909, fleeing from pogroms, trekking from the Ukraine through Western Europe to Hamburg in order to board a ship that — God-willing — would take them to the shores of Argentina where the Rothschild family, along with other prominent Jews, had arranged for Jews of Eastern Europe to settle in under-populated agricultural areas. Yet again, there was no long-lasting peace. Even though the Jews had done their best to become patriotic Argentinians, they soon met again with anti-Semitism, violence, and even cold-blooded murder. It was in this situation that Mirta’s father decided to leave Argentina and immigrate to the United States, the land of freedom and unlimited possibilities. He left for Norte America when Mirta was eight months old and had his reluctant wife and baby daughter follow soon after. He worked hard and did well and was happy and content to live in America. However, Mirta’s mother was very family-oriented, and her parents, siblings, uncles, aunts, cousins, second cousins, third cousins, and, and, and, and, and … lived in Argentina. Lucky for her, Mirta’s father got a job with Pan America Airlines, which enabled the Trupp family to fly almost for free. Mirta’s mother made utmost use of this possiblity, and Mirta was dragged back and forth between the U.S. and Argentina. And this is what this book is mainly about — growing up torn between 3 cultures. Was Mirta American, or was she Argentinian, or was she — first and foremost — Jewish? She was trying to find out. For the Argentina family, she was American, but also Jewish. For the American Jews, she was Argentinian. For the American gentiles, she was Jewish or, maybe, just odd. Go figure. Isn’t coming of age hard enough without triple identity? Luckily, Mirta had a positive outlook on life and found her way. It wasn't easy. And it should also be mentioned that even here in America, Mirta had some nasty encounters with anti-Semites. What particularly impressed me about this memoir was the genuine love all these relatives had for one another. I have never experienced any such love amongst any kinship, and certainly not among my relatives. And while this love for extended family, as depicted in Mirta’s book, is the most heartfelt I have ever come across in any society, I found similar in Holocaust memoirs. I have found Jewish people to be very special. I think they are in average more intelligent, more good natured, and more loving than other nationalities and ethnic groups. Call me a fervent pro-Semite. :-)Why do I rate this memoir only 4 stars? About two-thirds into the book, my head was swirling with more and more relatives and friends and social get togethers. For a while the book read a bit like a YA book. Other than that, I very much enjoyed the book. It is well written, and I also learned a lot about the Jewish and the Argentinian culture. I even learned some Spanish, which I plan to try out on our Mexican household help, who doesn’t speak a word of English. All in all, I highly recommend this book to anyone who likes memoirs, likes coming-of-age stories, likes immigration stories, is interested in Jewish culture and Jewish family life, plans to travel to Argentina at some time or, sadly, doesn’t see the slightest chance to travel to Argentina at whatever time. And if you don’t fit into any of the aforementioned groups, read this book anyway. It is heart-warming. Amazon reviewers stated the following: "I really enjoyed the spirited journey of the author as she explores her cultural transition from Argentina to the sunny shores of California. It is rich and flavorful with the innocence of youth, the understanding and perspective that comes with age and exploration. Written in an easy to read format, it is satisfying on many levels; cultural, religious, family, generational and genealogical all at once. I love her visits back to Argentina and the "coming home" to California experience. I want a sequel to be written! ""This book is a pleasure to read. It flows, you keep turning pages, and the story has the ring of truth that a good memoir demands. It describes the cultural changes endured by immigrant families, making it the ultimate story of America. Pure enjoyment! ""Great book. The style, narrative and dynamics are superb. It is very inviting, and the book is hard to put down. As a native Argentinean I can say this is very genuine. it is very obvious this writer has the talent, knowledge and sensitiveness to take on other related subjects; understanding there is a big market hungry for the "memoir" genre, I personally think she would have many followers in other, more audacious stories. I sense her insights expand a lot further. This book clearly hints it, and I suspect we will see (read) a lot more of her bright mind and warm heart in the near future !!" This is a wonderful, human story about finding a place in the world, understanding where we come from, where our ancestors and customs come from, and why, what and who we are (taking a theme from the book). I laughed a lot (false teeth for cows?? ?, crazy Argentine happenings, unique situations and family members). There are wonderful serendipitous moments and a great love story. Mirta's voice is lovely and she comes across as a sensitive, brave and curious person. She paints a detailed picture of her family and the differences between cultures. I also learnt a lot about pivotal events in Argentine history from a personal perspective, which makes it all the more real. A great read. What a wonderful story. This made me think of my childhood, and my family's immigration to this country. Although they weren't from Ar-hen-teena, their stories are similar. I could relate to feeling "different" growing up as my immigrant mother shared many of the values that the author's parents exemplified. The times were different, as well. I enjoyed the way the author described her inner growth, her spiritual journey, and her many travels back and forth that made her who she is today. You can never know all a person carries with them by just looking at them. Luckily you can get some insight into this author's background and memories in this delightful read. This is the auto -biography from Mita Ines Trupp,. She moved with her family from unsafe Argentina to America. Seen with the eyes of a 10 year young Jewish girl until up in her teenage years. Leaving all her relatives behind in Argentina and being Jewish, opens many questions, how to approch that! They move to California and her parents want their children to mix into life there, but not to forget her heritage! Its a going back and forth between America and Argentina, where she also falls in love with a young man. How she was dealing with everything, is interesting to read. The culture shock, how she decited to learn more about her heritage and belief is inspirational! If you're interested in less common Jewish stories, you'll really love this. An incredible story told well. But the writing doesn't flow, for lack of a better word. It took me a little while to get into the voice of the book, then it took a while again when I picked it up a few days later. I wish there had been more pictures and pictures of a better quality. It was hard to really "see" the people because the photos were black and white and grainy because of the printing. But overall, a good read. I loved this book! A clean-read, funny, poignant...charming and educational! I was fascinated by the Jewish Argentina; one usually thinks of Russian Jews escaping to America...Ellis Island, Lower East Side etc. I was touched by the sweet, first-love story line and all the obstacles that needed to be dealt with. As an airline brat myself, I loved the Pan Am connection as well! Trupp's book touches on history and family, teenage angst and young love, faith and culture and becoming comfortable in your own skin. Easy to relate to these issues with or not you are from the Jewish Argentina family. 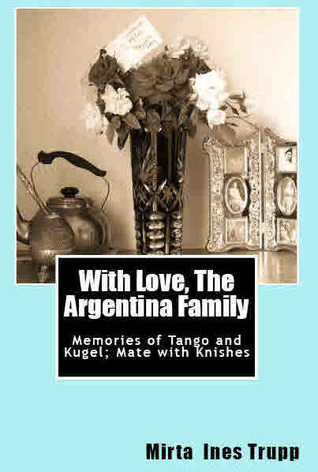 ‘With love, The Argentina Family: Memories of Tango & Kugel, Mate with Knishes’Although this book has a long title, I was drawn to it by certain words in the heading such as ‘The Argentina Family’, ‘Tango and Mate’. Also by the fact that I lived in Argentina for the first twelve years of my life.The author Mirta Ines Trupp has written a fascinating Memoir. Not only was she born in Argentina, she also went through the trauma of leaving the place of her birth with her Mother and Father to live on the west coast of the U.S.A. In a way this move brought serious differences between her Mother who missed her family and her Father who was determined to find a better, richer life for his wife and two children.Papi’s job with a prominent Airline made it possible for Mami to return often to Argentina, especially in the school holidays when she could take her two daughters to meet the extended family. As in my case, English people and other nationalities were drawn together in and around Buenos Aires, by language, customs and religion. We also had our own clubs but as children we did not question where we came from, but sometimes we knew our parents were sad and homesick.Mirta brings these feelings to life because as she grows up she begins to question about her past. She finds out about the sad times her ancestors went through when they left Russia and the atrocities suffered by her people in more countries than one. The era she covers in Argentina is not politically a happy one but the beauty of the country shines through. I cannot give away the ending but I can recommend this book to anyone who believes in social justice and the importance of family. What a wonderful story. I wasn't lucky enough to win this charming memoir; however, the author was kind enough to send me a copy. This story will appeal to any number of people interested in an immigration and assimilation story, but those with a Jewish background will be absolutely rapt. It is the story of one woman and her very extended family in both the United States and Argentina. By the time you finish the book, you'll want to drop in on the family. From reading the book, you'll know that you'll be welcomed.There is hardship in the story to be sure, but this book isn't a downer. The author is so positive and upbeat. It is told from her perspective, that of a sheltered child growing into an independent adult. You will enjoy going along on her journey. I really enjoyed this book. It is a memoir which I like to read and it is uplifting as well as written with humor (by Mirta) the central character. She has a very unusual story to tell and I gleaned a lot of details about how vital it was for her to tell her story about her roots, family traditions, her lack of knowledge of Judaism and her travels both literally and allegorically to understand how it will impact her future decisions and path. I had a particular interest since I have travelled to Argentina and am Jewish...and always enjoy a true love story. Trupp does a wonderful job of recounting her childhood and young adult years spent between the home of her devoted immigrant parents in California and her wide, extended family in Argentina where she falls in love as a young woman. I loved it because she captured so well so many of the struggles, connections and cultural blessings and challenges of second generation children. And I loved it because I've lived in both locations and her evocative, insightful descriptions brought back vivid, fond recollections. Well done. From the political turmoil and antisemitism of Argentina (1962) to the sunny shores of California, a young girl questions her father's decision to leave 'the Argentina family' behind and emigrate with his wife and two young daughters to America. It's a traumatic move for Mirta and even harder for her mother who often cries when she speaks of missing her family.Mirta studies hard, does well in school, but struggles with her identity. Is she American? Jewish? Argentinean?When her father gets a job with Pan Am, the family has the luxury of frequent visits to Buenos Aires where they share love, laughter, and unique customs with their close-knit relatives. With each visit, Mirta learns more of her rich family heritage and why her great-grandparents left their homes in eastern Europe to flee the organized massacres of Jews. They joined other Jewish families and set sail for South America.Written with honesty, it's a story of courage and family love. A good read! One I recommend. Mirta Ines Trupp’s cultural background stems from three sources, but not proportionally equal. She is first and foremost, American. The United States is where she has lived all her life and English is the language she speaks best. She wrote her book in English. Mirta was born in Argentina. She visited the country (sometimes more than once) practically every year from the age of seven on, thanks to her father’s fringe benefits as a Pan American Airways employee. Her numerous stays in Argentina as a girl left a profound imprint on her character. Her east-European Jewish culture is the one she is less versed in, yet, oddly, it’s the one she mostly tries to cling to.With Love, The Argentina Family is a chronicle of Mirta’s life from her earliest memories until the age of twenty-two. We accompany her through her childhood memories, her life in the San Francisco Valley, California, the adversities and joys of a teen-aged girl, her numerous trips to Argentina, her falling in love and the special circumstances of her marriage.“La familia” was a central factor in Mirta’s life, at the same time lavishing love and restraining her. “Where is life better, in Argentina or in the United States?” is a question ever-present in the family’s dialogue.The narrative is not lacking in humor, mostly based on language difficulties or in cultural differences, as when papi understood that his friend had died upon hearing that “the battery is dead”, or when mami asked the meat vendor if he had “any testicles”.All along this lovely chronicle we come across Argentinian and Jewish dishes, delicacies that add taste to the story, to say nothing of the Spanish and Yiddish expressions that are sprinkled along the text. I thought this was an absolutely fascinating memoir from Mirta Trupp. The story begins in 1962 with Mirta’s father emigrating from Argentina to America in order to create a better life for his wife and two young daughters. Once he was established he sent for his family to join him. It was easy to understand why he wanted to escape from Argentina where there was political turmoil and ongoing anti – Semitism. However a young Mirta can clearly recall her Mami crying for the ‘Argentina Family’. It must have been very difficult to be in a different country, separated from her sisters and family support network, and I could totally appreciate her desire to have frequent visits and to keep in touch. Mirta does well at school but struggles with feeling different. She is Argentinean, Jewish and American or is it Jewish, Argentinean then American? Fortunately for them her father gets a job with Pan Am which allows them to have concessionary travel. She has frequent visits to Argentina and the love and family ties are clearly portrayed. Through this time she is on a journey of discovery to find out about her Jewish faith and about the terrible events that led to her ancestors crossing the world to seek a better life in Argentina. It’s a remarkable story and I empathised with her desire to explore her family tree. It’s a story of courage and love which encompasses all within ‘the family’ It’s also written with honesty and clarity. I could hardly put it down! This book is touchingly written in a rather sentimental manner, as if a school girl is writing her diary. I was hoping it might throw light on the Jewish community in both the Argentine and in America, but sadly there wasn't much insight - only humdrum tales of what the families did at parties and that kind of thing.Very good reading for the author's family I'm sure, but doesn't tell you a lot.What was interesting, though, was the strength of anti-Jewish feeling in Argentina - whichg was appalling to read about.Nonetheless, it was a sweet tale, and the author gets to marry her boyfriend and have a baby in the last chapter.